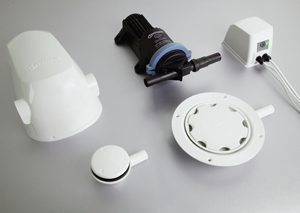 The original automatic shower drain kit with proven reliability and low speed pump settings. Modern compact aesthetics ensure that the kit blends in subtly to any bathroom. Kit includes 1 flow switch (Mixer shower please request extra flow switch). Kit includes 50mm Ø inlet pump waste. 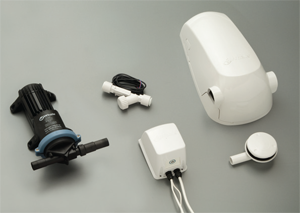 The Digital Instant Match Pump uses a digital signal sent from the Electric shower* to automatically adjust the pump speed in relation to the flow rate of the shower. Variable pump speed tracks the flow rate of the Electric shower. No flow sensor(s) to fit. 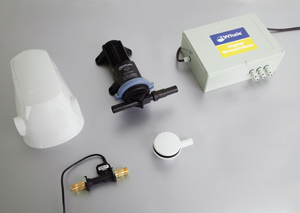 Kit includes 50mm Ø inlet pump waste and vinyl wet room pump waste. The Digital Smoothflow Kit is designed to minimise gulley suction noise by precisely matching the pump flow rate to the shower flow rate. Variable pump speed – commissioned to each specific installation. Variable speed ensures quiet system operation. Kit includes 1 flow sensor (Mixer shower please request extra flow sensor).